Settling quietly into the only chair in front of the shop, she plucked her pair of eyeglass, as she drew a long yawn. A wet morning that could keep anyone in bed, especially on a Saturday morning, Bisola Adebanke (real name withheld to avoid being reprimanded), a medical doctor, dared the treacherous weather condition to meet with her guest. Still looking dizzy, having just closed from duty (on call), which spanned through the night, the 39-year-old mother of one needed to vent her frustration, and very quickly too, before things go south. In spite of being a doctor at a major public hospital in Surulere, Lagos, Adebanke is currently battling to stay alive. She lamented that her workload was gradually eating into her health, after stripping her of quality time for her family, especially her little son. Once a bubbly and energetic woman, who had enviable passion for her job, her life took a troubling turn about three months ago when she slumped in her office while attending to a patient one fateful afternoon. After losing her four-month-old pregnancy, Adebanke is yet to fully get back on her feet but had been compelled to return to work to attend to patients. “Yet, my husband won’t let me resign,” she said, in a voice laden with regret and frustration. A doctor with nearly 10 years experience, Adebanke attends to an average of 100 patients several days in a week at the hospital. Debilitating and crushing, as can be imagined, the tough routine finally took its toll on her. Several weeks after that sad incident, she remains a dreadful image of her old self, struggling to stay alive and well. “I’m frustrated,” she said. “If it rains, I could see about 80 patients within 24 hours when I’m on call, which is three times a week. But if it doesn’t rain, they could be as many as 100, and sometimes 130. Same thing for my colleagues. “Due to stress; I know better as a doctor, I couldn’t conceive for years. When I did eventually, I lost it,”the visibly dejected lady muttered. “But I’m looking for job already and I would soon quit their job before they snuff out my life. Moving as Adebanke’s plight is, it is not a peculiar to her. In fact, her pain is one shared by dozens of other doctors working in many government-owned hospitals in Lagos and other parts of the country. While Adebanke is deeply angry about her overwhelming schedule that is fast depleting what is left of her interest in the profession she once adored, Hassan (other name withheld), a medical doctor at Ladoke Akintola University Teaching Hospital, Osogbo, Osun State, said his frustration had reached the peak but that he would soon leave the country. “Every day of the week, my colleagues and I have a workload that is meant for only slaves,” Hassan said in a clandestine interview with Saturday PUNCH recently. “And you know the saddest part, in spite of working twice as hard, we have been receiving half salary from the state government for about two years now. Is that not a tragedy? If I’m on call I attend to an average of 100 patients within the 24 hours and that is being modest. Notably, since the mass exodus of doctors to other countries, government at all levels have failed to employ enough doctors to replace those that left, forcing those left in the system to endure neck-breaking daily routines, and many in this category are succumbing to death and sicknesses after attending to an average of 100 patients a day. Nigeria, a nation on the brink of a precipice? But, the shortage of medical personnel in Nigerian public hospitals didn’t suddenly happen; many of Nigeria’s doctors and nurses have migrated to foreign countries, including the United States, United Kingdom, other European, Asian and African countries in search of greener pastures, leaving a huge personnel deficit in the nation’s health sector. The precarious situation was highlighted in 2016 when the immediate past President of the Nigerian Medical Association, Prof. Mike Ogirima, said no fewer than 20,000 Nigerian doctors were practising in America and about 15,000 in European countries. And in 2017, the chairman of Lagos branch of the NMA, Dr. Olumuyiwa Odusote, revealed that about 40,000 of the 75,000 registered medical doctors in Nigeria were practising outside the country, with a rather disturbing caveat that 75 per cent of those still in Nigeria were planning to leave. In 2017 alone, according to reports, 100 doctors resigned from University College Hospital, Ibadan, Oyo State while 200 doctors and nurses resigned from Ladoke Akintola Teaching Hospital, Osogbo, Osun State. Also, about 800 doctors resigned from Lagos State hospitals within the last two years, with over 50 in November 2017 alone. But, given all the doctors that have left Nigeria in the past few years, our correspondent gathered that there has been no major recruitment of doctors, whether by the states or the Federal Government. Odusote even pointed out that Kebbi State had not employed any doctor in two years, despite multiple adverts for employment. Also, in Lagos (with its rising population), Oyo, Osun and many other states, there has been no major employment of doctors, which explains the sad situation in public hospitals across the country. Meanwhile, the reasons some of the doctors who have left adduce for their exit range from poor condition of service, excessive workload, harsh working environment and poor remuneration. While the US, UK, Canada and Saudi Arabia have been on top of the list of countries Nigerians go to, a medical doctor in Lagos University Teaching Hospital, Adesoji, told our correspondent that African countries like Zambia, Rwanda and Tanzania had also joined the list of countries “harvesting” doctors from Nigeria. He said many Nigerian doctors are now taking the United States Medical Licensing Examination, which doctors trained outside the US take if they want to practise or do residency in the country, and its replica in the UK, which is administered by the Professional and Linguistic Assessments Board. Adesoji said, “It’s alarming. I can’t count how many consultants, including professors, that have left Nigeria for other countries and doctors are taking the exam every day. For every doctor that leaves, I can tell you that about four are also preparing to leave. Even me, I’m preparing to leave. He added, “In Ladoke Akintola Teaching Hospital, there were about two neurologists; one in Ogbomoso and one in Osogbo. The one in Osogbo left some months ago while the one in Ogbomoso has left too. Even if they have any left, it can’t be more than one or two. “In Nigeria, the giant of Africa, consultants earn about $1,000 (N362,000) plus or minus, depending on whether state or federal hospital, but in Zambia, they earn over $3,000 (about 1.08m) per month, which would be paid at the right time and you won’t be overworked, so, why won’t people leave? Just few days ago, a Nigerian doctor who practices in Leeds, United Kingdom, Dr. Harvey Olufunmilayo, lamented the rate at which doctors in Nigeria were seeking greener pastures in foreign countries, saying Nigeria was, in reality, playing with fire. He said since the exams is taken twice a year, with unabating challenges in the sector, more doctors would likely take the next exam in November. He noted, however, that the poor, the rich and leaders who refuse to do what is right would suffer the obvious inaction of government. According to the World Health Organisation, doctor-to-patient ratio should be 1:600, but in Nigeria, the ratio is tragically high. Saturday PUNCH once reported that the ratio of doctors to patients in Nigeria as of 2016 was one physician to 3,500 patients. In 2017, the Head of Ear, Nose and Throat Department at the University of Abuja, Prof. Titus Ibekwe, who is also a former NMA Vice-President, said the ratio in Nigeria was one doctor to 6,000 patients. Even though some reports, as alluded to by the Medical and Dental Consultants Association of Nigeria, put it at one doctor to 4,000 patients, many people describe this as tragic, shameful and highly disturbing, especially in a country where doctors are unemployed and many can’t find placement for their housemanship. Adesoji, a seasoned doctor concerned with the situation, said the country seems to be in a precarious situation, but that no one is doing anything about it. Odusote had earlier said that Nigeria needs 303,333 medical doctors at the moment and 10,605 new doctors annually. But, it appears Nigerians might have to contend with this acute personnel shortage for a long time. As of 2016, a previous report by Saturday PUNCH revealed that Nigeria could only produce about 4,355 medical graduates per annum, given the quota spelt out on the website of the Medical and Dental Council of Nigeria. The figure included those trained abroad. And given the mass exodus of the already inadequate personnel, perhaps it would require a miracle for Nigeria to have the number of doctors it urgently needs. This is even more so, because out of the 4,355 medical graduates, the maximum number of graduates that can be admitted for housemanship, based on the quota by the Medical and Dental Council of Nigeria, is 2,926, leaving 1,429 behind. Thus, while Nigeria is in dire need of doctors, about 40 per cent of its medical graduates cannot cross the housemanship hurdle to be able to practice. And even at the moment, a number of those who have crossed the hurdle to become licensed medical doctors are looking for jobs. Yet, there is serious health personnel shortage. Approaching the Maternal and Child Care Centre, an arm of Randle General Hospital, on Gbaja Street in Surulere, one would be somewhat confident of a quick access to health care, with its beautiful and relatively big structure. But, entering the place on a typical clinic day is like entering a mini-market, as it’s usually full of patients and rowdy, due to overpopulation. A staff member, who craved anonymity, told our correspondent that the influx of patients into the hospital not only force doctors in the hospital to work like slaves, it could scare any visitor. When our correspondent visited the facility penultimate Monday, several sick patients were constrained to stand or squat as all the seats had been taken. And, sadly, only one doctor was on duty. While the doctor refused to speak with our correspondent, the unnamed staff member said such overwhelming crowd was a norm in the hospital, and that since patients could not be sent back home unattended to, the doctors overwork themselves to see all the patients, making some of them to even fall sick. “Imagine a doctor seeing 120 to 130 patients in a day; that is why the doctors themselves are breaking down and falling ill. How do you expect them to give their best, especially when the management of the hospital doesn’t seem to care about their well-being? “We used to have many doctors in this MCC, and it is very popular in the whole of Surulere and environs, but due to the harsh working environment, the rising number of patients, refusal of government to employ more doctors, the work became too much and some had to leave the country, out of frustration. Interestingly, few months ago, some doctors in Quebec, Canada protested that they earn too much, while those in Nigeria are overworked and underpaid. He said, “Even when you could see that were really tired and were barely struggling to stay active, they have to keep seeing patients and that could lead to wrong diagnosis, because there may be no adequate time for quality assessment of a patient’s situation. The situation at the general hospitals in Ifako and Ikorodu was barely different, as there were also more patients than doctors, often putting the doctors under enormous pressure. Even at the prestigious UCH, the situation is the same. The doctors at the hospital told our correspondent that only labourers could have their kind of work for long. A doctor, who preferred to be identified as Seyi, said she would soon drop her letter of resignation, before she loses her life. “Imagine attending to about 90 to 100 patients within 24 hours, and that cuts across many departments. Even when I’m not on call and I’m supposed to close by 4pm, sometimes, we are made to continue till late in the night because the patients keep coming. It is sometimes hard to tell who is on call and who is not because we close late. Findings by Saturday PUNCH revealed that across the country, the doctor-to-patient ratio is appalling and a far cry from the recommendation of the WHO. It would seem only those who can afford private hospitals or treatment abroad are immune from the dysfunctional health system in Nigeria, which is riddled by long waiting hours – due to fewer doctors – and absence of basic infrastructure, among other issues bedeviling the sector. This has not only led to an increase in self medication and patronage of traditional caregivers, patients wait for as long as months, even for serious ailments. Just few days ago, the news went viral about a woman, identified as Omolade Abiara, who said she took her daughter who had ear infection, on referral from Isolo General Hospital, to the Lagos State University Teaching Hospital, Ikeja for treatment. But she said she had to leave out of frustration. Abiara said she got to the hospital about 6am but she wasn’t called in until 11:30am. As if that was not bad enough, even though due to numerous patients, she said she was told to come back in six months (November) to see the doctor, but she simply went back home, as presumably all the earlier dates were booked. She also cited the case of a lady she met there who had a more serious ailment, with thick mucus dripping from her ear. She said the lady, who had been parading the hospital, was also given November date, until she (allegedly) gave money (bribe) to some persons before the date was changed to July. The long waiting hours that characterise many public hospitals seems to be putting doctors at risk of attacks or assaults from agitated patients and their relatives. Just a few months ago, the relatives of a patient threatened to kill a doctor at MCC, Randle Hospital, Surulere for not admitting their relative immediately, even though there was no bed space. About two weeks ago, also at MCC, another doctor was almost beaten up in the night by relatives of a patient for not attending to their relative, even when the doctor was busy attending to other patients. 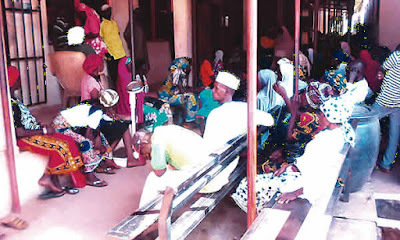 The NMA Chairman in Oyo State, Dr. Mojisola Atalabi, told Saturday PUNCH she is worried with how grossly understaffed UCH is, saying the situation was having a negative effect on the health of the doctors and nurses who had to work for longer hours because they did not want patients to be turned back. Meanwhile, the chairman of NMA in Sokoto State, Dr. Usman Malami Aliyu, has attributed the alarming ratio of doctor-to-patients in Nigeria to lack of manpower, brain drain, unconducive working environment, inadequate facilities and poor remuneration. In Kwara State, the acting Chief Medical Director of the University of Ilorin Teaching Hospital, Prof. Olayinka Buhari, and the Director-General, Kwara State Hospitals Management Bureau, Dr. Olubunmi Jetawo-Winter, said the number of patients attended to by doctors varied. They, however, noted that they would always operate by the rules. Speaking on why the government had failed to employ physicians from the pool of unemployed doctors across the country, the Minister of Health, Prof. Isaac Adewole, said health care was not the exclusive duty of the Federal Government, as he blamed the shortage on states, even though federal institutions are equally understaffed. He said the system needed to be repositioned to reduce the number of patients going to tertiary health institutions, by strengthening primary health care centres and putting a lot of emphasis on prevention. Meanwhile, senior officials in the Health Ministry in some states told our correspondent that the drop in revenue, huge wage bill and backlog of salary arrears had constrained the government from employing more doctors. But, speaking to our correspondent on why the Lagos State government has not employed doctors in spite of the rising shortage, the state Commissioner for Health, Dr. Jide Idris, said government was recruiting in stages, due especially to the financial implication. He also promised to look into the precarious situation at MCC, but that he couldn’t say, specifically, when the approval to recruit into general hospitals would begin. Additional reports by Olufemi Atoyebi, Chukwudi Akasike, Eniola Akinkuotu, Mudiaga Affe, Success Nwogu and Adeniyi Olugbemi.